The Secret Writings of a Junior Doctor. Junior doctors enter the profession wide eyed, stethoscoped up, and ready to put their years of book-worming to good use. In many cases, however, we find ourselves doing something completely different. A role less “House” and more “House-keeping”. As Junior Doctors, we are the file carriers, the blood runners, the phone callers, and the form fillers. We run from wards to A&E departments and back again, occasionally fitting in a patient here and there. IT “solutions” which act only to silo our patient’s information and obstruct our clinical workflow. At some point during all of this, we eventually manage to provide care to our patients, as well as maintain our endless string of exams and competencies. This is not what we signed up for, it’s not what we’re trained to do, and it’s not what our patients need... so why do we tolerate it? Why are there so many disgruntled Junior Doctors frustrated with an outdated, disjointed IT system they didn’t create and can’t change, longing but unable to perform the role they’re so desperately needed to fill. I would argue that we have no shortage of Junior Doctors. Instead what we have is, in effect, an excess of medically-trained IT administrators. to get the job done. We have convinced ourselves that by acting as the sticky plasters required to keep a failing system running, that we are doing a service to those who rely on it. Through years of learned helplessness, we Doctors have given up on trying to change the system and now find ourselves tolerating an IT system that doesn’t work for us. What other industry would tolerate this? As seen on a recent BBC program “The Computer Will See You Now”, the world’s biggest IT companies are battling it out to create Artificial Intelligence capable of doing the work of Doctors. up with three key skills: information gathering, communication, and analysis. Teams of highly paid professionals devised this list, which you’ll notice has absolutely no mention of secretarial skills or in-depth working knowledge of a hospital’s various login codes. If IT companies, with billions of pounds at stake, have come up with this simple list, why don’t we follow suit? Let’s start treating Doctors like Doctors and not IT administrators. As a Junior Doctor, information gathering is central to my role. It’s also in my interest to make this process look effortless, to keep the façade of coping maintained and to most importantly, never complain. A difficult ask in a system where information is siloed among a myriad of disparate IT systems. junior doctors to vent their frustration. But on the wards we change from keyboard warriors to glorified secretaries, unpaid porters, and prescription pad pen- pushers. Have we ever stood back to wonder how it got like this? Why aren’t more of us holding our hands up and saying “enough” to the latest “solution”? Who among us has recently looked up from the leaking helm to ask who’s steering the ship? The reason we’re not acting to shape a healthcare IT system that works is because we’re too busy being the sticky plasters holding the current one together. While we login and type and push and pull and phone and phone again, it’s the Consultants, the IT managers, and the CEO’s making the decisions that impact us and our patients most. So what does a hospital IT system need to do? Ask a CIO and they’ll rattle off a list from their latest tender process. 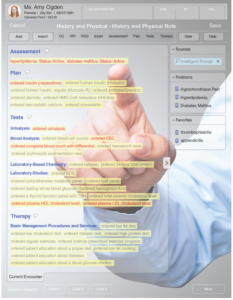 Ask a Consultant and they’ll cite the latest journal articles on optimum Healthcare Information Technology. Ask a junior doctor, and you’ll get what boils down to one simple answer: Integration. the meetings, but the bitter irony is that these people are far too busy wrestling with the existing disparate systems to offer their input regarding the latest addition. And so the problem deepens. What do we do? Add another solution to the mix? Definitely not. We need to add a single solution on TOP. The one place IT can make the biggest impact remains a niche market, where only a handful of pioneering, physician-led tech companies are based. We don’t need another labs system, we don’t want another clinical portal, and we certainly don’t care which big IT company bought out the other to provide these solutions. We just want to treat our patients. What our IT system needs is a common user interface which takes the data from the numerous systems and provides physicians with a one-stop- shop for clinical workflow. A single user interface where we sign in once and have everything at our fingertips. Let the big tech companies figure out the intricacies of data sharing, let the CIO worry about data integrity, and let the Doctors get back to their job: being a Doctor. Before we implement one more IT solution, let’s answer the silent cries of frontline staff, and make a genuine effort to integrate.